Read more for the how-to! 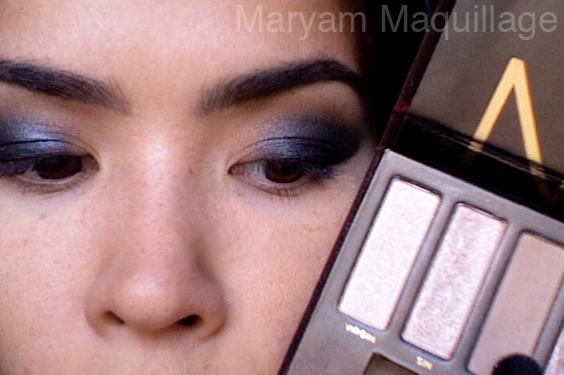 For a full description and comparison between the two palettes, go to Kandee Johnson's blog and drool like I did. For now, enjoy my easy tutorial! 1. Start off my priming your lids with UD primer potion. This is a mandatory step for any dramatic makeup look. Once the primer has settled (after a minute or so), heavily line your top lash line using a black liner starting at the center of the lid and wing it out towards your temple. Don't worry about being neat--the rougher the edge the better. I'm using UD 24/7 glide-on pencil in Zero that came with the first edition palette, but if you don't have Zero, use any creamy black eye liner. 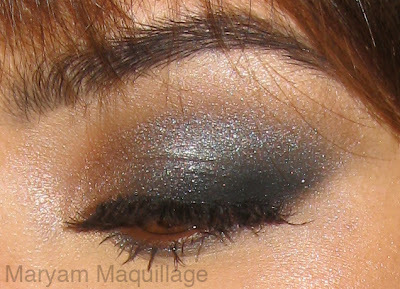 Next, take a dense smudger brush and smudge out the liner using Creep (see "your right" eye :) Again, don't be too neat. 2. 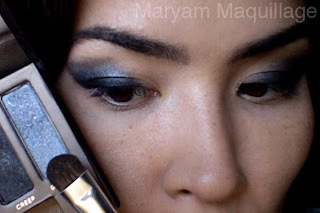 Taking Gunmetal shadow and a flat stiff brush, apply the color to the outer corner right above Creep, using patting motions. Try to keep the shape slanted, placing the color on a diagonal and lifting the outer edge of the eye toward the corner of the eyebrow. Make sure to keep the inner third of the eye blank and only add Gunmetal to the center and outer lid. 3. Taking Creep again, either on the smudger brush or on a flat brush, apply it close to the lash line, darkening the outer corner and blending the two colors together. Use patting motions to blend / layer Creep over Gunmetal and vice versa. 4. Using a fluffy dome shaped brush with Naked, blend out the harsh line above Gunmetal eye shadow, using windshield wipe motions. Don't go too far into the inner corner because you will drag the dark color with you--stop in the middle of the lid. 5. With the same brush, apply Buck to the border between Naked and Gunmetal to create a smoother gradient. I like the apply Buck after Naked because I want to make sure I only add a little bit of color. If your blending skills are impeccable, you could probably skip this step. 6. Clean off your flat brush and apply Toasted to the inner third you left blank. Using patting motions, layer Toasted over Gunmetal and vice versa to blend the two together. 7. Taking a stiff angled brush, apply Virgin right underneath your eyebrow, blending the color down over Naked. Tip: To bring out your nose bridge without contouring, apply a frosty eyeshadow (Virgin) to the area right under your eyebrow. I do this to fake a nose bridge--mine is quite flat. 8. 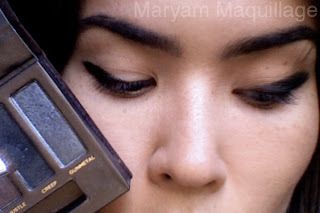 Finish the eye look by lining the waterline with a brown liner, if you're brown-eyed like me. If you have blue, green or any other color eyes, line the waterlines with black. I used Whiskey, from the double ended UD 24/7 glide-on pencil that came with the first edition original Naked palette. 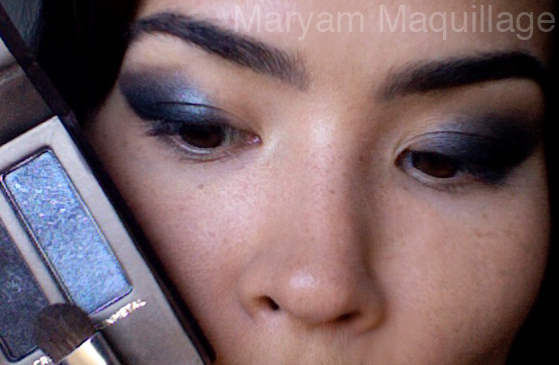 Next, smudge some Creep, Gunmetal and Half Baked under your lower lash line to prevent the pencil from running. Use Creep in the outer third of the lash line, Gunmetal in the middle, and Half Baked in the inner third. Apply mascara and add falsies to complete the look. I finished the look by contouring my nose ever-so-slightly using Buck and adding Sin as a highlight on the tops of my cheekbones and cupid' bow. My lashes are Ardell Wispies and my clear gloss is a no name brand. Is NAKED 2 on your wish-list? Woah I didnt even know they were making another one! i wish the naked2 palette looked more different than the naked1, i feel like i can't justify buying it!! Love the look! I love the Naked palette so I ordered my Naked 2 this morning and can't wait for it to come in =) Hope you get yours soon! You look SO gorgeous. Love the look. I managed to pick up a Naked2 palette before it sold out (by accident, too, I casually visited UD and saw it, bought it, 15 mins before the email got sent out) but wish I'd snagged another one! Love, love this look! You look so hot! I skipped the first Naked palette, so I think I'm gonna get the Naked 2! Very very pretty look! I'm obsessed with Naked, so naturally, i ordered the Naked 2! Love this tutorial and look, I'm definitely going to try it out!!! I ordered Naked 2 today and it's already shipped ahhh I'm so excited especially since I held off on getting the first one! Yup, love my Naked palette! It's not just hype to me! I'm going to wait on the Naked 2 till I get some moola! I love this look, and will try it out....maybe even tomorrow! I love the Naked palette and Naked 2 looks amazing too but I am not sure I'd purchase it because it has too many shimmer shades. Nice tutorial- and I feel ya, want that UD 2 as well!! gorgeous! what flat brush do you recommend? you always have a gorgeous make-up! MY FIRST SMASHBOX AND RIVER ISLAND GIVEAWAY! thanks ladies :)) I'm sad because Naked 2 is sold out and I missed it by seconds, literally!! @Sara H: The Naked 2 actually has more matte eye shadows that then first one... I want it sooo badly!!! 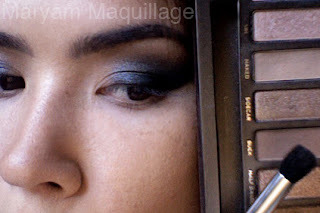 I don't even have NAKED original yet LOL but if I could just get that gorgeous gunmetal shade, I'd be happy. I hope you get NAKED2 for Christmas! GORGEOUS! And such a great tutorial! Perfect look!!! I love your eyes!! hiya i really like this smokey eye make up/look its so edgy maybe you should make a video about how to do this? id love to learn? Ohhhh ohhh ohhhh I have to say I just immediately fell in love with your blog!! great tutorial! you look absolutely gorgeous! Yup....I copied it, here's the look! http://glitterandunicorns-angiebee.blogspot.com/2011/12/getting-naked.html Thanks so much for the inspiration! Absolutely gorgeous, love!! I bet after looking at this tons of women that never wanted this palette before will run out and buy it. ;) You made me want to buy it and I already have it! Lol! The word Naked conjures up a lot of exciting images - of naked colors being mixed in a naked palette with a naked brush and naked make up applied to naked eyes! And the result - the most gorgeous looking pair of naked eyes! Congratulations ! Looks like the whole world is going for Naked Palette. Such a beautiful look, your eye color really pops! Gorgeous! This makes me want to buy the Naked Palette. I skipped it because it seemed a bit neutral for my taste but I see now that it can also be used for smokey-eyed goodness! You and me both hun. Ud junkies all the way. Can't wait to get this new palette. I'm hitting pan on my naked and buck.